Sinister Cyclops GS, is a two person, highly motivated and skilled studio that focuses on all aspects of video game development. We create and control everything, from concept art to audio and from level design to animations. Using the latest technology to our advantage we strive to give gamers what they deserve: fun, challenging and entertaining games, anyone in the family can enjoy. Sinister Cyclops Game Studios is an independent video game developer founded in 2014. The team consists of two inquisitive Greek American brothers who are first generation gamers. One, a tech savvy businessman and the other a musician with a passion for the digital arts. Far from being just a motto, “Old School meets New Technology “ reflects the dynamic duo’s contrast in age and character. If there’s one thing they have in common, it’s their laconic approach to video game creation: simple, straightforward and devoid of hype. 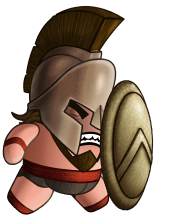 Nearly four years in the making, their first game, “Spartan“, is a labor of love and the product of hard work and dedication.